The potter's wheel evokes a sense of mystic bewilderment—the way tho-se deft hands shape delicate smooth wet earth over the spinning wheel, and how the dried earthen pots are then fired at high temperatures to become tough. Some pots store water and some overflow with billowing froth of lentils cooked over slow fire, while other decorative pots are used to make yogurt or filled with syrupy rosogollas. A potter from Azamgarh, Uttar Pradesh, recently explained how potters have “seasons” for the kind of pots they make. During the wedding season, they make kalash and various shapes of handis and sakoras (shallow bowls) that are used for rituals. They make garden pots and decorative pottery thoroughout the year. Potters have now started innovating with finer finish, smooth glaze and decorative elements. Earthenware have numerous regional inter-pretations. For instance, the teacups from Azamgargh have a shiny black colour. A potter reveals the technique: the terracotta vessels are fired till they become fully baked and strong. In the last stage of firing the pots, they smoke the furnace by adding dried leaves. The smoke and soot coats the pots and gets baked along, making the pots sooty black. After the first baking, mustard oil is smeared on the pots, and then, a second round of firing fixes the black colour and the pots become shiny. The tradition of black pottery of Azamgarh is little known. While some potters are really poor and are looking for alternative livelihood options, others are making enough money to keep going. Take for instance the Manipuri potters, who make the traditional longpi pottery. This beautiful black pottery is made with a mix of a black stone powder and clay. The pots are then shaped and fired the same way as the terracotta pots. Longpi pottery is interesting as potters have inno-vated with new shapes and sizes making baking trays, beautiful kettles, tea cups and beer mugs, bowls and plates, salad bowls and serving platters. They also decorate the edges or handles using cane weaving. The educated Manipuri potters have made a mark and Longpi pottery is now available on some e-commerce websites. Another interesting place to find ex-quisite pottery is Gundiyali, a village in Kutch region, Gujarat. The potters here have been making the same designs of pots and pans since 5,000 years, which apparently emerged from the excavations of Harappa and Mohenjo-daro. Interestingly, the potters not only use the spinning wheel to make perfectly shaped pots, but they also use a technique called Ghadayi, where they gently beat the half-made matka (ghada or round pot for water storage) from the outside using a flat wooden disc with a handle. The potters are so adept that they can create perfect round matkas using this technique with bare hands. Some potters from Kutch have evolved a method to make pots and pans suited for modern kitchens. Their craft is available on a website (www.mitticool.in) which sells various types of kitchen and dining utensils made of terracotta. Some unorganised potters also make beautiful water bottles with lid, water jugs, insulated casseroles and dinner sets too. Even a tawa (griddle) with a handle and a metal base has started making waves among those who love using terra-cotta pots. Kutch potters are also known for their beautiful intricate paintings on the pots, much like the Kutch embroidery. The sedimentary soil used for making terracotta pots is a renewable resource and the process of making pots doesn’t burden the environment with toxic chemicals and pollutants. What’s more, they are mostly similarly priced as mid-level ceramic or glass tableware, sometimes cheaper too. The lifespan of a terracotta tea cup or a handi can be as good as a glass utensil. Our festivals and religious rituals have helped survive the profession of a potter. Potters across the country make diyas (lamps) for Diwali, kalash and matkas for wedding rituals. I remember the Kuldevta pooja (praying to the family deity) in our ancestral home where it was mandatory to cook the prasad in earthen pots over wood-fired chulhas. The village kumhar (potter) would be summoned during religious ceremonies to make specific sizes and shapes of pots to store water, milk and ghee and one kadhai in which the prasad is deep fried in cow ghee. The traditional art of the kumhar commu-nity has survived due to the constant demand of earthen pots throughout the year. Kumhars are also in demand for making idols of Gods and Goddesses for worship, especially during Durga pooja and Ganesh pooja. Interestingly, these idols are immersed in the nearest waterbodies after the festival is over. Imagine the fine sedi-mentary soil that is collected from dried up ponds. Hindus have a theory of being born of panchtatva (the five elements around which life evolves) and getting merged with panchtatva after death, and these earthen idols follow the same path. A potter’s work is enchanting indeed. Apart from their aesthetic beauty, earthen-ware enhances the quality of food cooked. The terracotta tea pots and cups are a lot better than bone china and ceramic or even glass tumblers. Just take care to buy well-fired earthenware. Terracotta pots are also great for the dum cooking technique. In Kerala, chattis (pans) are still used for cooking fish and prawn curries, though it has become less frequent. Once heated, the terracotta pots need lesser flame heat to cook. People line the pots with banana leafs to slow cook food in minimal oil in Kerala. In urban kitchens, the terracotta pans can be lined with aluminum foil. In earlier days, each pot was filled with water for a few days so that the pores got filled with minerals in water. This way the pots did not absorb the aroma of foods being cooked, and the next food being cooked would not carry the flavours of the previous curry. To clean earthen pots and pans, just rinse them with water first and then use a hard sponge with diluted liquid detergent before rinsing them thoroughly with run-ning water. Let them dry completely in the sun before storing them. No need to sun the pots if they are being used every day. One can even dry the cleaned pots in the oven. So when you plan to make some rustic daal or saag next time, try to get an earthen vessel and spend a couple of hours cooking for the family. Wash, clean and drain all leafy greens and chop them roughly. Chop the garlic greens finely. Add all the greens inside the matka along with 500 ml water and cook with the lid on for 10 minutes on high flame. Then lower the heat and simmer for about 40 minutes. Whisk the yogurt and add to the cooking saag. 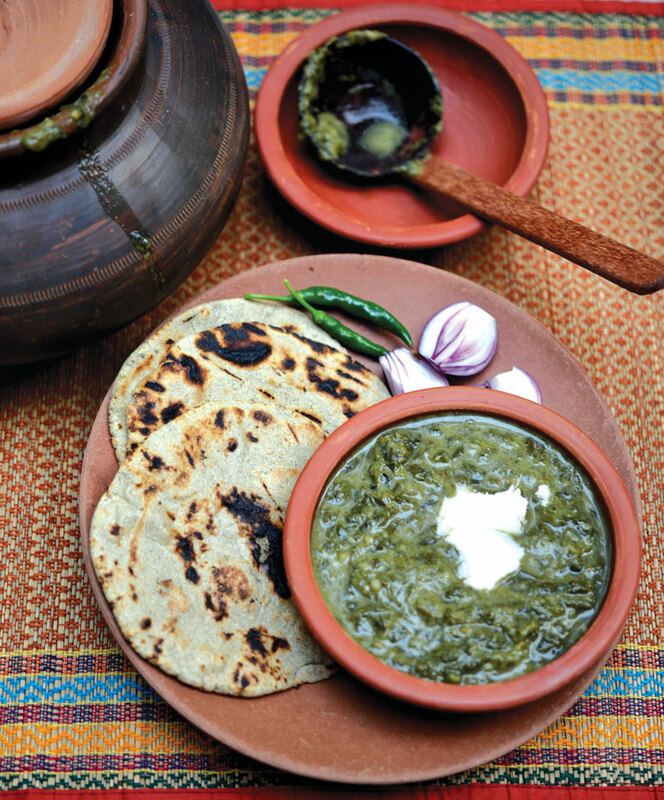 Now mash the cooking saag using a wooden mathani (churner). Cook for some time more till the saag becomes mushy, but not too smooth. Add chopped ginger and green chilies. Mix well and cover. Switch off the gas stove and let the pot sit for another 10 minutes before serving. Serve hot with miller rotis, garnishing with freshly chopped onions and some fresh white butter. In villages people still use earthen pots to cook rice and rasam. Also earthen trays for curd making.